Pioneer today introduced Rayz Rally, which it claims is the world's first Lightning-powered plug-and-play speaker that has no battery. The portable speaker can be used to listen to music, but Pioneer is heavily marketing it as a speakerphone for conference calling. For conference calling, Pioneer says users simply plug the Rally into the Lightning connector, initiate calls from the iPhone, and the call is automatically transferred to the speaker. Despite being small enough to fit in a pocket, the speaker is supposedly loud enough to be used in a boardroom. The speaker has a single button on the front that can mute/unmute calls or play/pause music depending on what it's being used for. 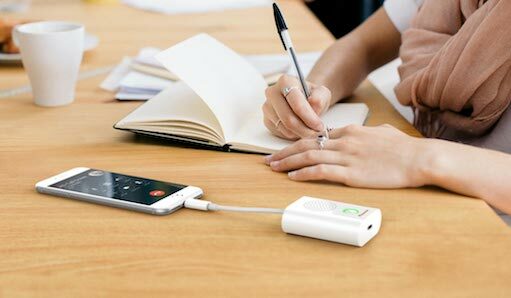 It also has a female Lightning connector that allows the speaker to be used with a Mac or PC, or for pass-through charging to an iPhone, iPad, or iPod touch, with a Lightning to USB cable. The speaker works in tandem with Pioneer's free Rayz Appcessory Companion App on the App Store [Direct Link] for iPhone, iPad, and iPod touch. Pioneer said the Rayz Rally is available today for $99.95 on Apple.com and at Apple Stores worldwide in the colors Ice, Onyx, and Space Gray. It's also available on Amazon in the United States. Prices vary by country. Well they sure pioneered this product category. Oh oh OH! What's that thing between the phone and the speaker...? Oh, it's a cable? Weird, feels so... last year. I'll stick to Bluetooth. People comparing this to a bluetooth speaker seem to be missing the point. It is a speakerphone you don't have to worry about keeping charged first and foremost and a speaker secondary (probably because people would complain if it didn't play music). I work remotely and often have to struggle on the other end of a call with my boss who never thinks to be sure the audio setup is good for me as the lone remote person. If this gets good reviews, she will get one as a gift from me to save me from metaphorically squinting my ears every time work calls and throws me on a crappy speakerphone. Anyone who says "yeah, but a lot of bluetooth speakers already have a speakerphone function LoL0lL111" probably haven't been on the other end of a call using a bluetooth speaker. Most of them have absolutely horrid quality. Pioneer, unlike Logipuke, has always had fantastic fidelity, along with the best support I've ever received from an audio company. I will give this a try. I just wish the Echo had speaker phone capability. For some reason I can't fathom Amazon won't flip the switch to allow iPhone access to the microphone. Does anyone know if the HomePod will have speaker phone capability? Because if it does, that's what will probably push me over the edge to try it out and possibly eventually ditch Amazon. I really don't want to be ill-hearted here; but I really don't understand why this product exists... Especially at that price point. Some of us have different needs. I need this. Man, I wish there was a wireless technology that did the same thing...oh wait...there is....and it's been around since before the original iPhone. It's called Bluetooth. At $100, that's a very tough sell. I could see the appeal at $20.